The short-tailed hawk (Buteo brachyurus) is a small tropical hawk that is uncommon in Florida and even rarer in other parts of the country. In fact, the Cornell Lab of Ornithology refers to it as “one of the rarest and least-studied birds in the United States.” They breed mostly and live mainly in Central America and South America. 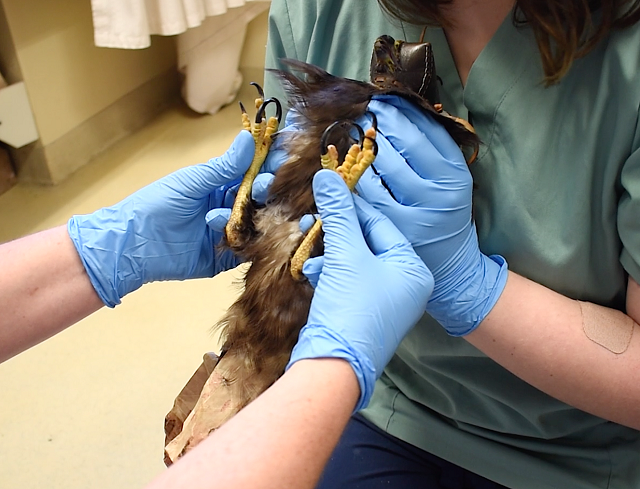 Short-tailed hawks do not like to be in open areas much. They would rather be perching in hidden areas and soaring out of observers’ eyesight when hunting. After prey is spotted, short-tailed hawks make steep free fall dives to catch mainly small birds perched on treetops. These hawks are closely related to red-tailed and red-shouldered hawks, but can have two plumages – clear and dark. Dark ones are more frequent in Florida. 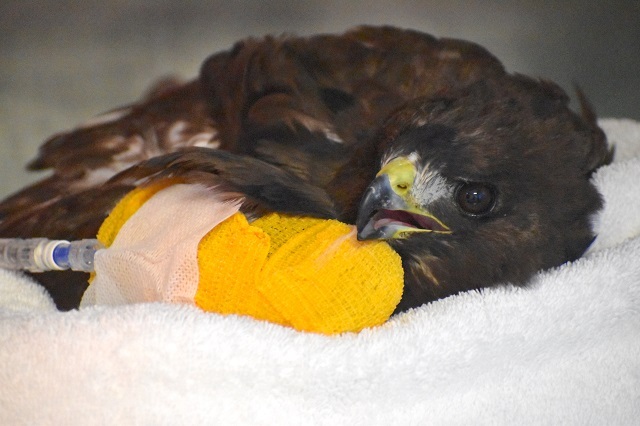 At CROW, a juvenile short-tailed hawk was admitted from a Cape Coral golf course after being found lying down and unable to fly. Veterinarians noted that the patient had moderate paraparesis and was unable to stand. After a physical exam, radiographs and bloodwork, veterinarians did not notice any obvious signs of trauma or any fractured bones, but suspected the paraparesis may be the result of a spinal trauma. CROW Case of the Week stories are written by Bob Petcher and appear weekly in the Island Sun and River Weekly Newspapers. If you would like to make a donation to CROW, click here!